Join our Strathmore Station Tour for an insider’s view into life on the land followed by a delicious home-baked morning tea. Discover inspiring stories of our pioneering heroes at the Australian Stockman’s Hall of Fame. Late afternoon, experience the warm hospitality of local graziers on our Camden Park Station Sunset Tour with Dinner. Witness a totally different way of schooling on a tour of the Longreach School of Distance Education. Visit historic Rosebank Station originally settled as a sheep and cattle station some 100 years ago. Visit the world-class Qantas Founders Museum, eloquently telling the story of the founding of Qantas. View marvellous interpretive and interactive exhibits then join a guided Jets Tour. Late afternoon, unwind on the Drover’s Sunset Cruise with tasty onboard nibbles platters followed by a two-course table service dinner under the stars at Smithy’s Outback Dinner & Show. Travel into the heart of Waltzing Matilda country and drive along private tracks to the beautiful Carisbrooke Station. Here we’ll follow the scenic Cory’s Range drive to the Three Sisters rock formation, fossick for opals and enjoy a relaxed billy tea. Witness a prehistoric event from some 95 million years ago at Dinosaur Stampede, Lark Quarry Conservation Park. Join an interpretive tour of the world’s only recorded dinosaur stampede featuring over 3000 footprints frozen in time in ancient mudflats. Return to Winton for a relaxed dinner at your accommodation tonight. Guests on LLW8 will arrive in Brisbane. *Rail subject to availability. Rail price based on return Aust. Govt. Senior Card holder fares in a First Class sleeper on the Spirit of the Outback between Brisbane and Longreach. Please ask for Queensland Pensioner and Full Adult rail fares. Please pass on one almighty huge thank you to our head tour guides Brett & Kathy along with their assistant guides. What a wonderful crew indeed. I had a most wonderful tour with a great "bunch" of people. My thanks to you also, the office staff, in the smooth running & organisation of the appropriate paper work and dispatch of same. Last, but not at all least, to Alan & Sue. A great tour company folks. Keep up the good work & if there is to be any improvement to be made, gee, I'd like to know what it is. Once again, thank you so much for a most memorable outback tour. Regards & my very best wishes to all concerned & that goes to all of those great people who painstakingly run the cattle and sheep stations. May you have that rain when you need it. Something for everyone! We did the Longreach Winton tour arriving by " Outback Spirit".Great trip with something for everyone, Robert and Cossie made everyone feel relaxed and got us to all our tours on time. The company owner made us lunch at his homestead one day and expressed how grateful the locals are that we had spent our tourist dollar in their region. We have been fortunate and spent quite a lot of time in the outback - l called this my soft tour-hard roofs and proper beds, however the sunset drinks, bbq and stargazing at the Age of Dinosaurs was a highlight level to anywhere else we have travelled - well done! Longreach Winton Tour - Recently enjoyed a 7 day tour of Longreach and Winton with Aussie Tours. Owners Alan and Sue are to be congratulated for the consistently high level of professionalism of their business. Could not fault any part of it. Our driver Robert and his wife, tour hostess Cossie, added to the excellence of our experience with their depth of knowledge and obvious love of this beautiful part of Australia. The range of activities was well thought out including a visit to Alan and Sue's faithfully restored heritage home. The isolated dinosaur museum and stampede were among the many highlights their accessibility made easy via the well-maintained and comfortable coach. Would highly recommend this company and trip. Amazing outback tour! 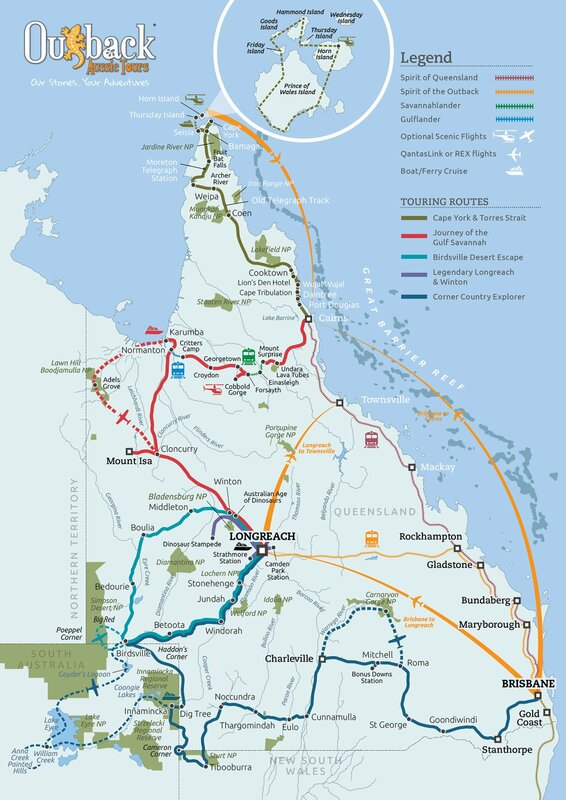 From the minute we stepped off the train we were made to feel special and shown how important tourism is to the survival of the country areas of Queensland. Our tour guides were Rob and Cossie and they were incredibly friendly, organised and knowledgeable. We experienced first hand some of the reality of life around Longreach and Winton as well as the amazing museums and experiences on offer. I was pleasantly surprised by the amount of cultural heritage that is celebrated through Qantas Museum, School of Distance Education, Stockman's Hall of Fame, Qantilda Museum, Dinosaur Stampede and Age of Dinosaurs. The tours were brilliant, the food amazing and the company excellent. I recommend this tour with this company to everyone, we should all experience and celebrate the people of the outback. Great Value, more than you expect in a tour! From our arrival by train from Brisbane, we had a full tour package. We had a daily program issued on arrival & we visited Qantas Founders Museum & were taken with a guide over an early version of a 747 as well as a 707, we visited the Aust. Stockman's Hall of Fame with an excellent show under cover. We had a tour with the owner of Strathmore Station property relating what happens daily as well as droughts & floods, the care of the land and the care of animals. We had all meals included at hotels, farms & roadside as well as morning teas. On one night we had a Sunset Cruise, BBQ & entertainment on the side of a billabong, just amazing. On this tour we also visited Winton for 2 days where we visited the Aust. Age of Dinosaurs Museum & the Stampede of the Dinosaurs display at Lark Quarry. Our driver Robert & his wife Cosi attended to us all the way with careful driving & attention to detail at each stop. Just marvelous in all aspects. Terrific range of attractions covered in Legendary Longreach and Winton Tour! Tour bus and wonderful hosts greeted us at Longreach Station after a 25 hour train trip from Roma Street Station in Brisbane. Each day we were greeted with enthusiasm and details of the days activities. Each evening a precis of the expectations of the following day. Meals at each place were healthy and wholesome. All attractions were marvellous and staff informative and knowledgeable. Altogether a most marvellous, memorable experience and week away in the West of Queensland. Congratulations on a fabulous team of people who work together to give tourists a great welcome! Amazing Longreach and Winton Tour! Each day was eclipsed with more venues and attractions ably guided and narrated by Kathy and Brett of Outback Aussie. We didn't have to lift a finger apart from getting our bags to the bus and all meals, check ins, venues and entertainment were all supplied - an amazing experience and such great value. We never knew so much existed in that part of the world and I would not hesitate to recommend Outback Aussie - Alan and Sue Smith's family run Company to the world. We shall return.